and 25 May 2009 Windmill Hill, Wiltshire, England. 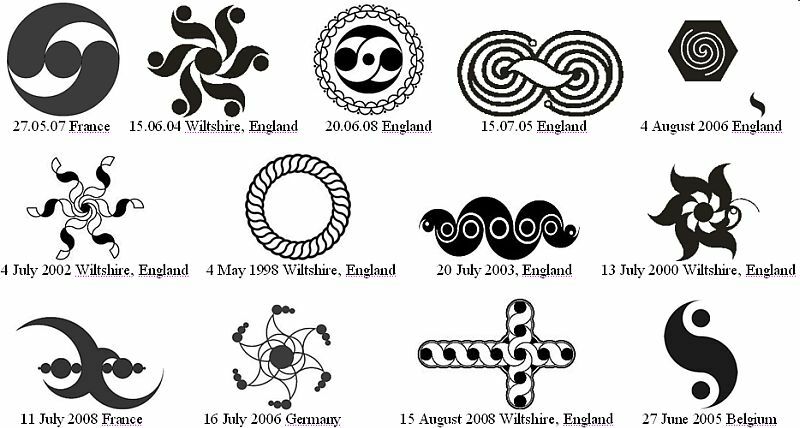 Many crop circles researches consider that crop circles of May 9, 2010 Wiltshire, England and May 25, 2009 Wiltshire, England are similar. It is really so. They both transmit life important information about Earth magnetic field danger. Summary. Pictograms inform that now on Earth is very dangerous situation for mankind life connected with beginning of global cataclysms as a result of magnetic field decreasing. There is only one way to prolong our life. All civilization has to unite consciousness. Consciousness unification will cause an action which will transform our body. We will make the Transition to other level of material world without cataclysms. On this safe level we will prolong our life. ETC constantly use this principle of a body transformation for flights in universe. Hysteresis loop - the symbol of the weakening of Earth magnetic field ETC warn that Earth magnetic field reduction has reached the critical value and global cataclysms will begin very soon. Therefore in the centre of both crop circles ETC have placed the symbols of hysteresis loop. Hysteresis loop has two branches – the magnetization (lower) and demagnetization (upper). Reducing of planet's magnetic field, observed by scientists, indicates that the Earth's magnetic field corresponds to the upper branch – demagnetization. The transition of planet from the cycle of magnetization to the cycle of demagnetization occurs through the beak of a hysteresis loop. Therefore beak of a loop is a very important turning point. ETC use the image of a loop’ beak as an additional symbol of the magnetic field. In the centre of this crop circle there are two hysteresis loops – one over another. Two ends of these loops are not shown in full, and two other ends are hooked bent (fig. 1.1). In addition, two sharp beaks of two other big and terrible hysteresis loops rest into the dark circle in the center (fig. 1.2). In the centre of crop circle is also shown the united consciousness cell of civilization (fig. 1.3). It is the goal of this pictogram. This cell confirms that civilization has to unite consciousness. Only the united consciousness will save our life from cataclysms. Hysteresis loops and information cells of human being corresponding to our life intertwine. It shows a big danger of Earth magnetic field condition for our life. Big gray circle in the centre of the picture (fig. 1.3) represents a brain area of the united consciousness cell. From two sides of this united consciousness cell, two circles with small gray circles in the centre are shown (fig. 1.4, fig. 1.5). So, the principle of the united consciousness formation is shown: unification of two individual cells (fig. 1.5) forms one united cell with expanded brain area (fig. 1.3). The Principle of the united consciousness formation is presented in many objects of the ETC System of Information Transmition (SIT). This Principle is presented in crop circles (fig. 1.6, fig. 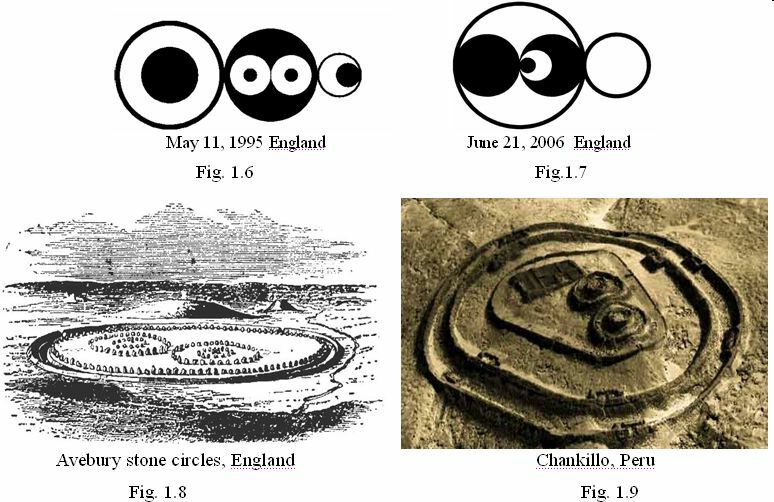 1.7); Avebury stone circles in England (fig. 1.8), built about 5.000 years ago; ancient monumental complex Chankillo in Peru (fig. 1.9), made in 4-th Century BC in coastal desert and others. SIT includes many objects created by ETC for thousands of years all over the world: Stonehenge; Avebury stone circles; Mexican pyramids the Moon and the Sun; moai of Easter Island; сomplexes of Peru – Saksauaman, Cuzco, Machu Picchu, the Nazca Lines; complexes of Yonaguni and Okinawa and others. All these information pictograms have the same coding principle and symbols. All SIT objects were created by information technology unknown and disabled for mankind. ETC show that information technology is based on the united consciousness action. Near both individual cells three increasing circles are shown (fig. 1.10). These are three previous levels of consciousness which are included in each individual cell: levels of inorganic and organic nature consciousness. Beaks of two huge and terrible hysteresis loops (fig. 1.11) form two blocks of half-moons, located from the both sides of the united consciousness cell (fig. 1.12). Half-moons connect each individual cell with a united consciousness cell. So, unification of people’ consciousness is shown. Each block includes six half-moons. The number «six» underlines a carbon basis of our life. ETC have sliding consciousness. In the result many pictogram symbols have several meanings. So, six half-moons mean a result of two individual cells uniting, each of which contains three previous levels of consciousness. Summary. This crop circle the same as the previous picture informs that our life on Earth depends of magnetic field condition. With the beginning of global cataclysms it will be impossible to live on Earth, and our civilization will be interrupted. The only way is through unifiсаtion of civilization consciousness to make the Transition to other level without cataclysms. There our life in a following cycle – the cycle of Correction will be prolonged. Global cataclysms is natural process that will transfer our Earth from the planet of present development of consciousness to the planet of past. In the centre of this crop circle a symbol of hysteresis loop (fig. 2.1) and the information cell (fig. 2.2) are shown as on previous crop circle May 9, 2010. But this cell is combined image of two cells – individual and united. Light small circle in the center is the brain area of individual cell. Bigger dark circle is expended brain area of united cell. The symbol of hysteresis loop (fig. 2.1) is similar to a boat and consists of six thin loops. The same as in the previous crop circle the number six points on a carbon basis of our life. The united consciousness cell (fig. 2.2) with dark big circle, shown in the centre of the picture, presents a main idea of the pictogram. Thus ETC inform that mankind should organize the united consciousness immediately. The principle of the united consciousness formation is shown by complex consisting of two individual cells from both sides of the united consciousness cell shown in the center (fig. 2.3). Individual cells are shown as two small circles with small area of a brain (fig. 2.3). Individual cell is a representation of human being on the Information level of the Universe. Hence, it is each of us – you, he, me, … etc. On both sides of the central unified consciousness cell, there are two small hysteresis loops (fig. 2.3). Both beaks of each loop bend around individual cells (fig. 2.4). It means that our life on Earth totally depends on the condition of its magnetic field. Each small hysteresis loop contains three cells-circles (fig. 2.4). Two cells at the edges have a light middle and central cell – dark. In accordance with the central combined cell, light and dark middles of cells means an individual and united cells. Consequently, in the center of each small hysteresis loop are placed united consciousness cells. Thus, in each small hysteresis loop the Principle of the united consciousness formation is revealed – unification of two individual cells form the united consciousness cell with expanded brain area. This Principle of the united consciousness formation is presented also by hysteresis loops – big central and two small side loops (fig. 2.5). Big and small sizes of hysteresis loops show expansion of brain area as a result of consciousness unification. Beaks of the central big hysteresis loop are connected with beaks of two small loops by six increasing circles (fig. 2.6). Thus six previous planets of Solar system from Pluto to Mars are shown. The seventh planet –Earth – is shown in the center of a hysteresis loop by a big circle. This big circle in the centre transmits double information, being simultaneously both a planet and combine cell. The interior part of central big hysteresis loop is divided by thin lines into six similar loops (fig. 2.7). It informs, that six previous planets of Solar system from Pluto up to Mars also the same as Earth had a hysteresis loop at the base of their development. 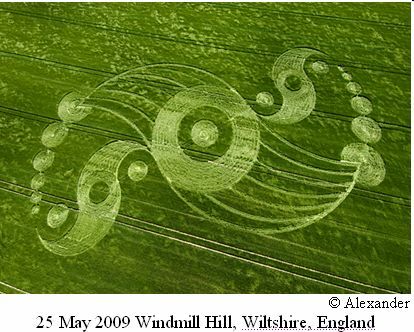 ETC repeatedly gave this information, for example, in crop circle 16 June 2004 Wiltshire, England (fig. 2.8). Six previous planets of Solar system – dwarf planet Pluto, the Neptune, Uranium, Saturn, Jupiter, Mars – developed on the base of a hysteresis loop. These planets in the form of six circles are shown in beaks of six hysteresis loops. The planet Earth is shown as seventh big circle in the center. The same planet – our Earth is shown also in the center of crop circle 25 May 2009 Wiltshire, England. ETC present information about Earth magnetic field in many crop circles which contain symbol of hysteresis loop and its beak. It is known that the Earth's core is ferromagnetic. Therefore, in our understanding the reason of the global cataclysms beginning explains the Barkhausen effect (fig. 3 a), which occurs in ferromagnetic materials. According to the Barkhauzen effect in some areas of both ascending and descending branches of hysteresis loop of ferromagnetic material spontaneous jumps of magnetization arise (fig. 3 b, c). Jumps occur suddenly reaching value of «field of start». In the beginning arise single jumps. Then, their number is growing. Jumps overlap on each other. In the cyclic remagnetization Barkhausen’ jumps form «packages of magnetic noise» (fig. 3 d). Start of Barkhausen’ jumps, the speed of their rise and form of «magnetic noise packages» depends on properties of ferromagnetic material. In the soft carbon steels Barkhausen’ jumps occur slowly and sluggishly. In solid stainless steel - the number of jumps increases very rapidly. The Barkhausen effect is widely used for nondestructive testing of ferromagnetic materials’ condition in many branches of industry: aviation, machinery, etc. This effect – a prerogative of physicists and we will not go deep into this theory. We will note, only, that on macro level of a planet Earth these jumps of magnetization correspond to earthquakes, tsunami, flooding and other natural catastrophes. ETC confirm that the decreasing of Earth magnetic field has almost reached the field of start. That is why shortly nature catastrophes will begin. However, before the start of a global cataclysm three preliminary of incredible strength will happen. We never see such phenomena of nature. After three preliminary catastrophes continuous, increasingly cataclysms will begin, which will cover the entire Earth. Our planet as if will revive. Cataclysms will never stop in difference to American movie «2012», but become stronger. Because it is the beginning of a new cycle of the planet – the cycle of active destruction. Since then, our planet moves into the category of planets of the past development of consciousness. The main process in the universe is the development of consciousness. In the Solar system there are two groups of planets - terrestrial and gas. Thus are presented planets of past, present and future development of consciousness. Planets of past include the dwarf planet Pluto, all gas planets and Mars. Planet of present development of consciousness is our Earth. Planets of future development of consciousness are Venus and Mercury. Destruction of the planet Mars began relatively recently, yet it refers to a group of terrestrial planets. On Mars is completed the first phase of destruction. It is connected with leveling of the planet surface and dissipates (pulverization) of its structure. This process was accompanied by strong earthquakes. As a result, the mountain turned into a pile of stones. Today on Mars observed global dust storms, the largest in the Solar system. This is second stage of planet destruction. Scientists confirm that long ago on Mars has been a strong magnetic field, dense atmosphere and water. As a result of the weakening of the magnetic field and the refined atmosphere all the water has evaporated. The weakening of the magnetic field and thinning of the ozone layer is observed today on Earth. Earth is also gradually becomes similar to Mars, and then will belong to the group of gas planets. Time to the consciousness improvement on planet Earth is already over. Just our generation is honored to make the Transition to the next cycle of life. ETC confirm that it is impossible to make the Transition alone or by several people. Only the entire civilization of Earth through united consciousness simultaneously can make the Transition to another - the Highest level of the material world. We now live in the cycle of Consciousness. At the Highest level of the material world will begin a new cycle of life – the cycle of Correction. Everyone will be responsible for actions, which he made in the cycle of Consciousness.